These charming Fuzzeez craft kits are perfect for creating your favourite soft toy dog, cat or bear. Each set comes with a mould and enough ‘wondrous wool’ to make a gorgeous plush animal. Simply spray the wool with water, place it in the mould and pop it in the washing machine for a quick spin. Watch in amazement as the wool comes out transformed into a cuddly toy. The sets also include eyes, noses and fastening clips to personalise your new soft toy any way you want. 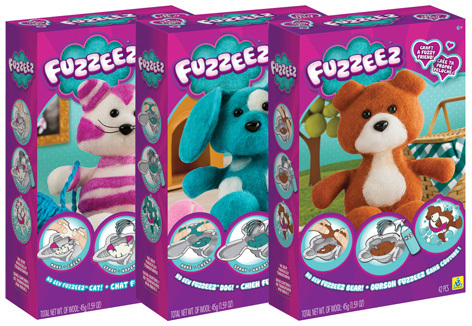 Fuzzeez are just a small part of the Orb Factory’s toy ranges, all of which are distributed by Asobi in the UK. Other products include Sticky Mosaics, Imaginista Bracelet sets and Pixel Pops. Please tell us what you think of the Fuzzeez by Asobi.